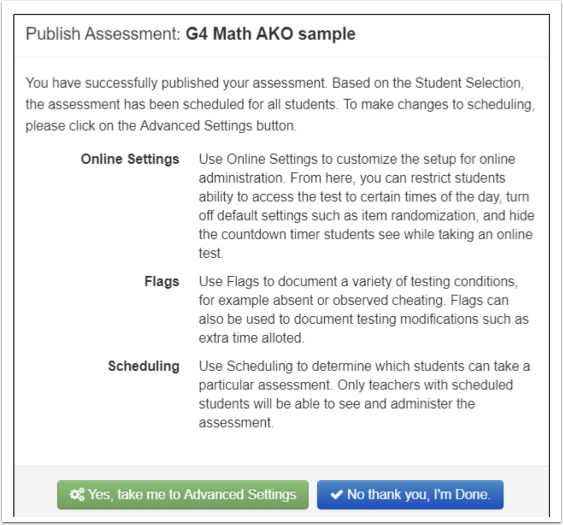 One of the assessments that can be created in SchoolCity SUITE is an Answer Key Only Assessment, or AKO. 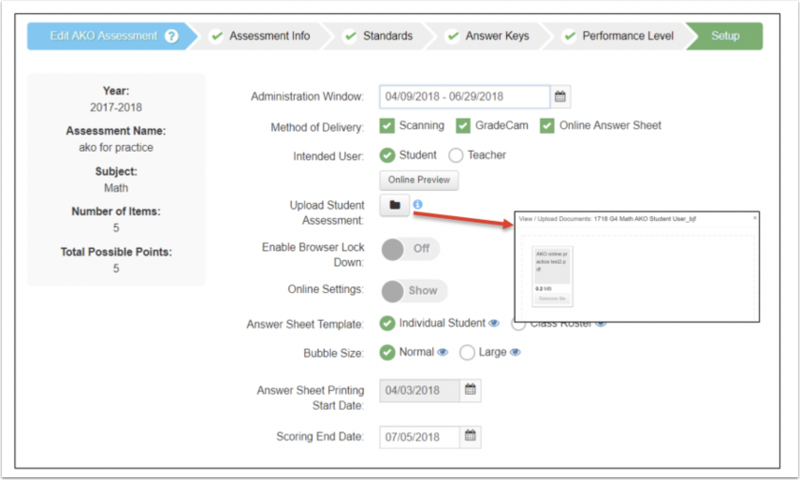 This assessment allows you to create an answer sheet for an existing assessment which can be aligned to standards and scored using GradeCam™ technology or with SchoolCity Scan and supported scanner. It can also be administered online in the Student Portal with an uploaded PDF of the assessment. Notice the arrows indicating the setup process at the top of the page. The current step will be highlighted in green. School Year: The new assessment will default to the school year as set in My Preferences. To select another year, click on the current year and select the desired year from the drop down. Assessment level: Depending on your role, you may be able to create assessments at the School and/or District level. Select the level appropriate for this assessment, if a selection is available. Subject: Select the subject from the drop-down menu. You can add other subjects in the next step, if desired. Existing Collection: (optional)Assessments may be organized into folders called Collections. You can add an assessment to an existing collection or create a new collection. 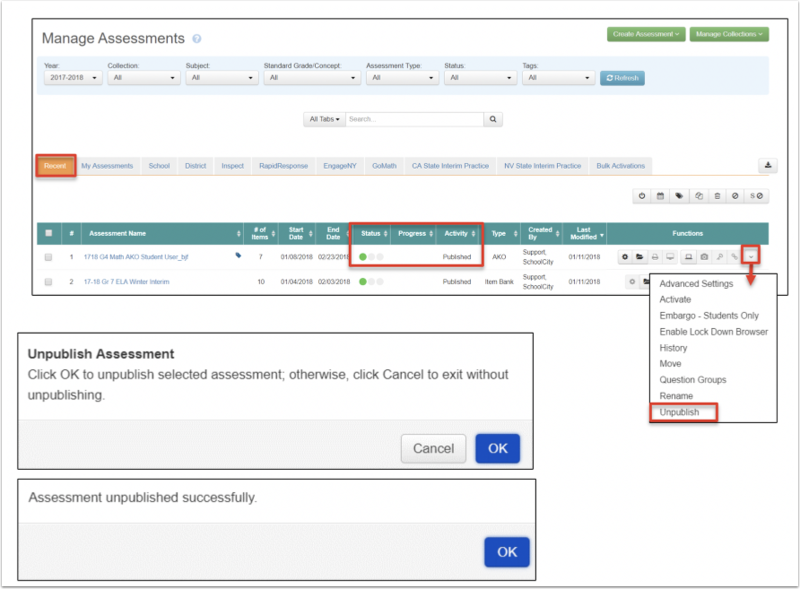 Collections may also be made from the Assessment Manager. Setup for Multiple Grades (optional): Slide No to Yes to set up the assessment for multiple grades. This will combine unique grade level assessments into a single, multi-grade assessment. Students will not be able to take the assessment online. Note that this option is not necessary for course-based assessments. Schedule all students: If you are a teacher level user, then all students are all the students on your roster(s). If you are a school level user, then all students are all students in the school. If you are a district level user, then all students are all students in the district. Schedule students by grade level: Use this option if you want only students in a specific grade(s) to take the assessment. Check the box(es) of the grade(s) you wish to schedule. Schedule students by Course Group or Course: Use this option if you have created Course Groups in the Group Manager or would like only students in a specific Course(s) to take the assessment. Schedule students by Student Group: Choose this option if you have created student groups in the Group Manager and want only those students to take the assessment. Save/Next: In the lower right corner, click on Save if you are done with your selections and wish to exit the system to return later. Click on Next, to go to the next step. Your work will be automatically saved. Note: For each step in the process, you must click on Next to complete the current step and move to the next step. When this is done properly, a green checkmark will appear in each process step at the top of the screen. The assessment cannot be published until all steps in the creation process have been checked. The next step in the creation process is to determine which standards, if any, you want to align to the assessment items. No Standards Selected: Select this option if you do not want to include standards in this assessment even though it may be aligned to standards. Not Aligned: Select this option if the assessment is not aligned to standards. Select Math Standards: For Math (and other content areas except ELA), the grades will populate first. When the grade is selected, the domains will populate. For ELA, strands will populate first, then grade levels. Select grade: Select the desired grade/domain/topic and the standards will appear on the right-hand side. Select Standards: Select the appropriate standard(s) from the list by clicking on the check box next to the standard. The box will change to green with a white checkmark. Selected Standards: The selected standards will be displayed in the Selected Standards section. Add Subjects: If you want the assessment to include standards from other subjects, select Add Subjects button to see a menu of other standard sets that are available. Select the standard set you want and then select the standards as done previously. Previous/Save/Next: Click on Next after you have made all the standards selections and you wish to continue with your assessment creation. Your work will be automatically saved. If you are done with your selections and wish to exit the system until a later time, click on Save. If you need to go back to the previous step, click on Previous. Enter the number of items on the assessment and then click on Update. A matrix will populate below with a row for each of the items indicated. The default item type is MC (Multiple Choice) but this can be changed as shown in the next step. Select the Question/Item Type for each item. CR= Constructed Response, EBSR= Evidence-Based Selected Response (online only), MB= Multiple Binary, MC= Multiple Choice, MR= Multiple Response, NR= Numerical Response, SA= Short Answer. Select the # of Choices for each item, as appropriate. Select the Type of Choices for each item, as appropriate. Select the Standard(s) that align(s) with the item, if one or more was selected in the previous step. Click on the down arrow to see the functions: Copy Standards (allows you to copy the same standard for a number of consecutive items), Copy Entire Row (allows you to duplicate the row just created), or Delete (allows you to delete the row). Select NR, then click on Select Griddable Template. View the available templates and choose the one that is most appropriate for the item by clicking on Select This Template. 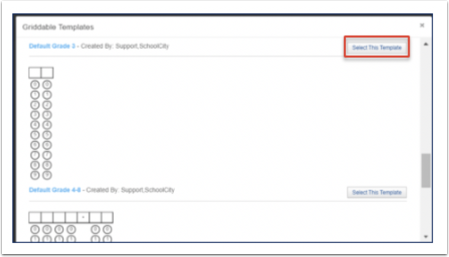 Note: If you need a template that is not currently available, work with your SchoolCity Administrator/Template Manager to request that it be created and made available. The template will populate on the Answer Key setup page. There will be black boxes for entering in the correct response and orange boxes underneath for adding a Tolerance value (T) if appropriate. Remove T by clicking on the orange T button. Enter the correct response by clicking in the circles in the template. Change the chosen template by clicking on the pencil next to the template name to view the existing templates again and chose another one. If you plan to administer the assessment on paper only, you may create multiple forms/versions for added security. Note: See pink warning. For Multiple Forms/Versions, all items must be Multiple Choice and have the same number of answer choices. Slide No to Yes. A message will appear informing you that students will not be able to take the test online. Click OK to continue setting up multiple forms/versions. Indicate the number of forms/versions you wish to create. Click on Update. New columns for Form A, B, C, etc. will appear. Reorder the items as desired. Performance levels are optional. 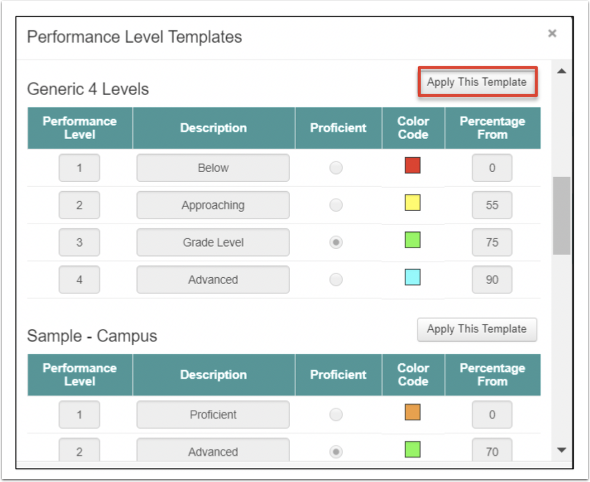 If available, you can use an existing template, or customize performance levels as desired. Performance levels help users to interpret their assessment data in reports. Load from Available Templates: Click here to use a template previously uploaded into SchoolCity by the District Template Manager, as determined by permission from the district administrator. 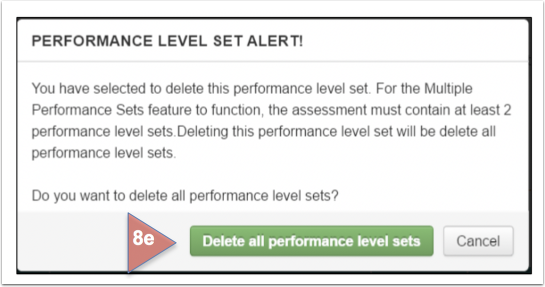 Add Performance Level Sets: Click here to include up to 2 additional performance level sets. Skip Performance Level: Click here if you do not want to add performance levels. A message will appear confirming this action. Click OK to go to the next step. Customize Performance Levels: Click here to create customized performance levels. Click on Load from Available Templates. The template will appear in the Performance Level step. You may edit the template by deleting levels, renaming the levels, changing colors, changing the “Percentage From” values, setup levels by Cut Points instead of by Percentage. (Optional) Click here if more than one set of Performance Levels is desired. For example, one set may be by performance descriptors and one set may be by alphabetical grades. A maximum of three Performance Level sets may be created. A minimum of two sets are needed to enable this feature. The first set will appear under an orange tab. Two new tabs will show Set 2 and Set 3. Click on the Performance Level Set 2 tab. Repeat the same process for the second set by either loading from available templates, or creating custom performance levels. Repeat for Performance Level Set 3. To delete Set 3, click on the x in the upper right corner of the tab. An alert message will appear. Click Delete or Cancel. To delete Set 2, click on the x in the upper right corner of the tab. A different alert message will appear. Deleting all performance levels will NOT delete Set 1. You may choose to create your own performance levels by percentage instead of using an existing template, or to modify an existing template. Click on Add Performance Level for each new performance level you wish to include. Beginning with the lowest level, enter the level number, description, and color code. Setup Performance Levels by Percentage: Select which level corresponds with proficient and enter the desired percentage correct for proficient and above. The cut points will be automatically calculated as determined by the total points possible. Setup Performance Levels by Cut Points: If you prefer to set up the performance levels by cut points instead of percentage, then select Cut Points, and enter the desired cut points for each level. The percentages will be automatically calculated. Previous, Save and Next: Click on Next after you have made all your selections and you wish to continue with your assessment creation. If you are done with your selections and wish to exit the system click on the Save button before exiting. If you want to go back to a previous step, click on Previous. The final step in creating the AKO assessment is to determine the administration details. Administration Window: Depending on the district default, normally the assessment window is set from the current date for 30 days. You can manually change the dates by clicking on the calendar icon, then choosing the date range of your assessment. Click on Apply to save your date settings. Method of Delivery: Scanning and GradeCam™ are paper/pencil methods using a scan-able answer sheet. Online assessments are administered through the Student Portal. More than one administration method may be selected, unless you are using multiple forms/versions. Intended User: If you are administering the assessment online, you must indicate the intended user Student or Teacher. Student means that students will be completing the test online in the Student Portal. Teacher means that the teacher will enter the students’ answers on a Student Answer Sheet (online) after students take the test on paper. This is intended to be used by teachers whose students may have difficulty bubbling in the answer sheet themselves. Upload Student Assessment: If you want to administer the assessment with an online answer sheet, upload a PDF of the assessment here. Click on the closed folder, and a box will appear where you can drag and drop or select PDF files to upload. Once uploaded, the folder will appear as an open folder. Online Preview: Click here to view the assessment as students will see it in the Student Portal. Enable Browser Lock Down: (only for districts that have Respondus enabled) Slide No to Yes. Online Settings: If you are administering the assessment with an online answer sheet, slide No to Yes to view the online settings. Answer Sheet Printing Start Date: Determine the date when answer sheets can be printed before the Administration window start date. Scoring End Date: Determine the ending date that Constructed Response items can be scored after the closing of the Administration window. Duration: If delivering online and you want the test to be timed, slide No to Yes, and determine how many hours/minutes you want to allow students to complete the assessment. Click inside the time boxes to select the desired duration. Default Time Increment: The duration can be increased or decreased by a set number of minutes as needed during the testing session. Time Window: Determine the beginning and ending times you want the assessment to be available to students. Days Window: Determine which days the assessment will be available to students. Properties: Select the properties you want for your assessment. 4 Digit PIN Verification: Pre-selects the requirement of a 4-digit PIN number for students to take an online assessment in the Student Portal. 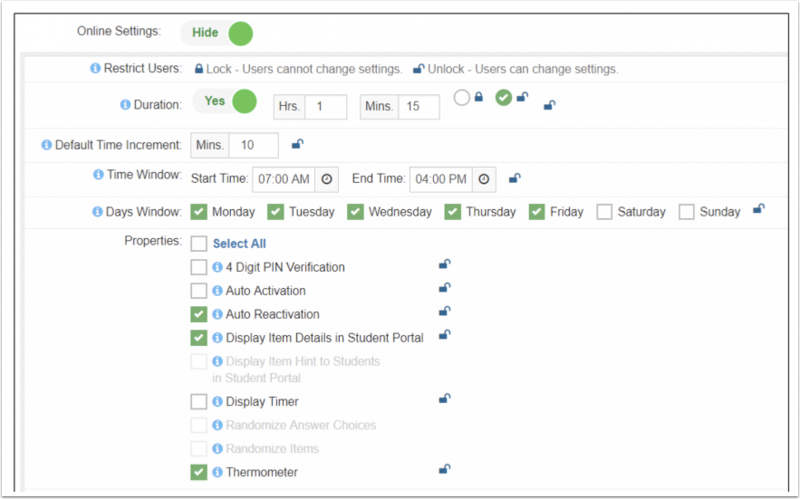 Auto Activation: Scheduled students will be automatically activated to take the assessments once it is published. Auto Reactivation: Once a test is activated, students will be able to re-enter an assessment during the administration window as long as the assessment has not been submitted for scoring. The following scenarios will allow the student to re-enter the assessment if auto-reactivation is enabled: student closes/refreshes the browser; the application times out; connection to the Internet was temporarily lost; student clicks the exit button. Display Item Details in Student Portal: Pre-selects display of item details in Student Portal when reviewing scores. This allows students to see the correct answer as well as their answer on all test items. Thermometer: Pre-selects the display of a thermometer that visually shows raw score, percent correct, and performance level (if applied during setup) immediately after the student submits an assessment for scoring in the Student Portal. Calculator: The three levels of calculators are Advanced, Basic or Scientific. Only one may be opened at a time. Tutorials on using each of the calculators can be viewed at http://learn.desmos.com. Equation Editor: The Equation Editor is part of the CKEditor text box formatting tools. There are four levels of editors: Elementary, Algebra, Algebra with Trigonometry, and Advanced. Students can use the CKEditor to write the equation in the space provided and click OK to enter it into the text box for scoring. 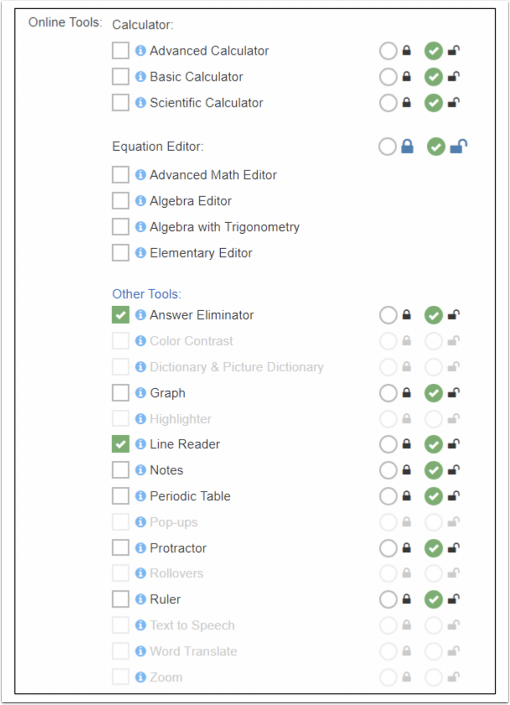 Answer Eliminator: This tool allows students to cross out incorrect answers. Graph: Virtual graphing paper in which students can add points and form lines. Line Reader: This is a moveable, resizable frame to help students read without losing their place. Notes: Allows students to click on the talk bubble to make a note to themselves and/or the teacher. The note is moveable and resizable. Periodic Table: A tabular arrangement of the chemical elements, ordered by their atomic number, electron configuration, and recurring chemical properties. Protractor: A protractor for measuring angles. Ruler: A ruler to measure length. Previous, Save, Save & Close, Publish: If you need to go back to a previous step click on Previous. If you are done with your selections but are not exiting the system click on Save. If you are not ready to deliver the assessment and plan to make edits, select Save & Close. This option will allow you to make any necessary changes to the assessment. You may publish later from the Assessment Manager screen. Select Publish when the assessment is ready to administer to students. If the Teacher will be administering the assessment on paper, and then entering the students answers on an online answer sheet, the setup does not include the online settings. Select Teacher as Intended User. Upload Student Assessment, if desired. Scoring End Date: Determine the ending date that student answers can be entered after the closing of the Administration window. When you publish your assessment, a message will appear asking if you are done or if you want to go to advanced settings. Advanced settings will offer you the opportunity to refine/revise your online settings, set flags and adjust the scheduling of students. If you want to skip this for now, click on No thank you, I’m Done. If you want to go to Advanced Settings, click on Yes, take me to Advanced Settings. The new assessment will be listed in the Assessment Manager under the tab in which it was created: My Assessments, School, or District. Assessments you have recently created or have been working with will be listed under the Recent tab. If the assessment has been published, its Status will show as a green and the Activity will indicate Published. To make any edits to a Published assessment, it must first be Unpublished. Click on the down arrow on the far right under Functions. Click on Unpublish. A confirmation message will appear. Click OK, and then again in the second message. Click on the gear icon to return to Setup. Make revisions and publish again in the last step of the assessment creation process.